The Minuteman Press image bank is available for use in communications related to Minuteman Press Bristol including newspaper, magazine, television and Internet. An evolving library of key images has been created which can be easily downloaded by left clicking on the desired thumb image, then right clicking and selecting ‘Save Image As’ on the high resolution click through image. Minuteman Press Bristol wins Best Business Award and Overall Winner presented by Nick Hewer (The Apprentice, Countdown, PR guru and so much more). Images by Story35. Minuteman Press Bristol wins Gold in the Best Fairtrade Office category presented by Claire Jacob, Partnership Development Manager, Bristol Green Capital Partnership. Images by Caro Hutchings. Minuteman Press Bristol win Travelwest Big Community Challenge presented by Councillor Rob Appleyard, Deputy Mayor, Bath & North East Somerset Council. Images by Mark Simmons Photography and Peter Wise. Minuteman Press Bristol wins Best Fairtrade Office presented by Burges Salmon solicitors, Helen Cooper, Managing Director of Neal’s Yard Remedies and Helen Holland, Cabinet Member for Adult Social Care. Images by @JonCraig_Photos. Minuteman Press Bristol wins Best Fairtrade Office presented by Burges Salmon solicitors, Liz Earle MBE and Molly Scott Cato MEP. Images by @JonCraig_Photos. 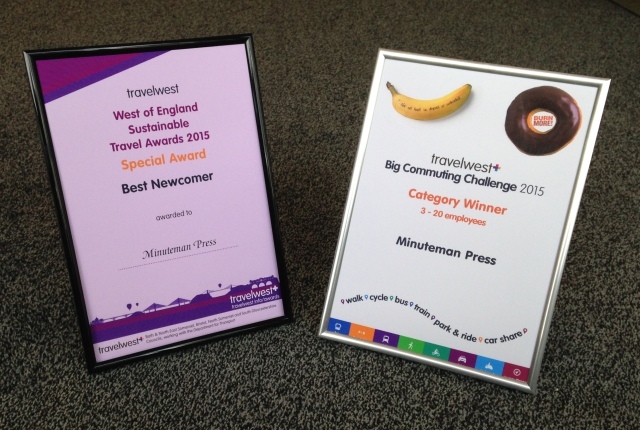 Minuteman Press Bristol win Travelwest Best Newcomer presented by Elfan Ap Rees, Deputy Leader, North Somerset Council. Images by Mark Simmons Photography. Minuteman Press Bristol win Travelwest Big Community Challenge presented by Mike Rees, Chief Executive Officer, North Somerset Council. Images by Mark Simmons Photography. Minuteman Press Bristol wins Gold in the Best Fairtrade Office category presented by Aardman Animations and Divine Chocolate. Images by @JonCraig_Photos. Minuteman Press Bristol wins Silver Website Award following assessment by a panel of professionals from the online industry. Criteria are provided by Mumpreneur UK. Minuteman Press Bristol wins the Internet Business Awards in the Print and Publishing category presented by Bristol’s Deputy Mayor and Cabinet Member Mark Bradshaw. Minuteman Press Bristol wins Gold in the Best Fairtrade Office category presented by The Observer’s ethical correspondent Lucy Siegle. Images by @JonCraig_Photos. Minuteman Press Bristol wins Silver in the Best Fairtrade Office category presented by journalist and news presenter George Alagiah OBE. Images by @JonCraig_Photos. The British Print Industry Federation (BPIF) Marketing Company of the Year Award presented by The Right Honourable The Lord Mayor of Bristol Councillor Christopher Davies to Minuteman Press Bristol. How the business cards of the great and the good may have looked: Guglielmo Marconi | Isambard Brunel | Winston Churchill | Albert Einstein | Edward Elgar | William Harvey | Sherlock Holmes | William Shakespeare | Alan Turing. Paul Iles. Litho Print Manager, Minuteman Press Bristol. Sophie Sansom. Print Production Manager, Minuteman Press Bristol. Justyna Steinkeller MA. Design Manager, Minuteman Press Bristol. Lucie Wise BSc Hons MA. Director, Minuteman Press Bristol. Peter Wise BA Hons MA FRGS FCIM DipM. Director, Minuteman Press Bristol.